Baird, Daniel. "Art and the Great War". The Canadian Encyclopedia, 10 April 2017, Historica Canada. https://www.thecanadianencyclopedia.ca/en/article/art-and-the-great-war. Accessed 21 April 2019. Landscape painting in North America in the 19th century tended toward the pastoral, depicting idyllic scenes of rural life and representing the continent as a wondrous Eden. Canadian master Homer Watson, under the influence of such American luminists as Frederic Edwin Church and Albert Bierstadt, created images that are serene and suffused with golden light. In On the Mohawk River (1878), for instance, a lazy river ambles between tall, overhanging trees — in the background is a light-struck mountain. In Watson’s world, nature is peaceful, unthreatening and perhaps even sacred. The landscapes of Tom Thomson and the artists who eventually became known as the Group of Seven — Franklin Carmichael, Lawren Harris, A.Y. Jackson, Franz Johnston, J.E.H. MacDonald and Frederick Varley — were, from the very beginning, markedly different. Working from sketches made during extended trips to Georgian Bay and Northern Ontario, these artists, in search of a pictorial idiom tailored to the Canadian experience, depicted the Canadian landscape as intensely physical and even volatile, subject to snow and wind and rain and fire, and not always welcoming to human beings. They were also acutely aware of the impact that human beings have had on the natural world. That consciousness grew deeper, and more tragic, for those who had direct experience with trench warfare during the First World War. 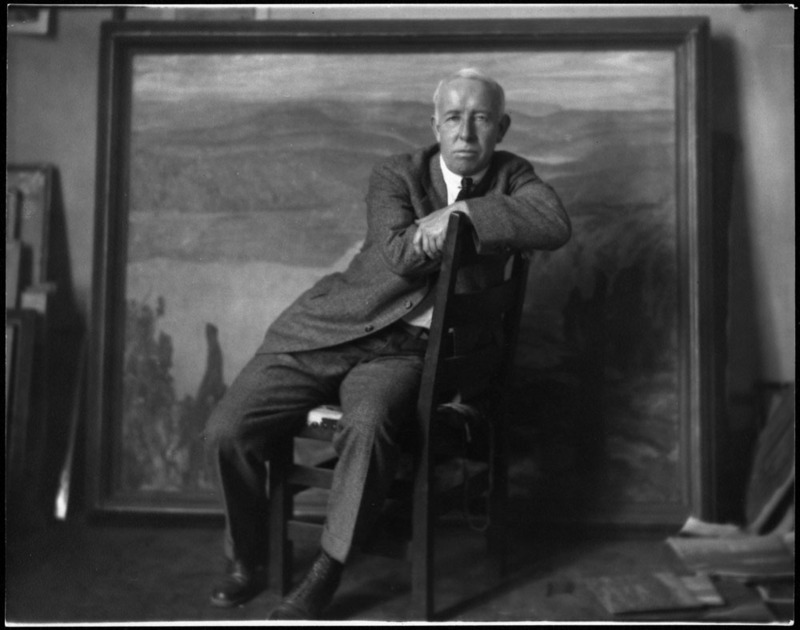 The two Group of Seven artists whose work was most intensely affected by their experiences in the Great War were A.Y. Jackson and Frederick Varley. Though contemptuous of the jingoism that inevitably accompanies armies of young men marching off to war, by June of 1915 Jackson had joined the 60th Infantry Battalion, Victoria Rifles of Canada — mere weeks after the devastating German gas attacks during the Second Battle of Ypres. 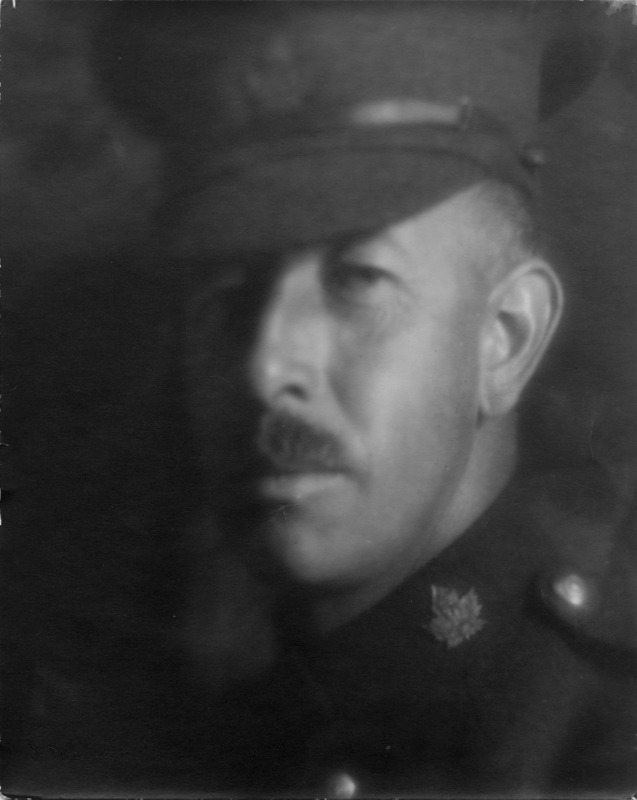 Jackson was eventually deployed to France, where he participated in the Battle of Mount Sorrel, a costly conflict that resulted in over 8,000 Canadian casualties. Jackson was among the wounded. 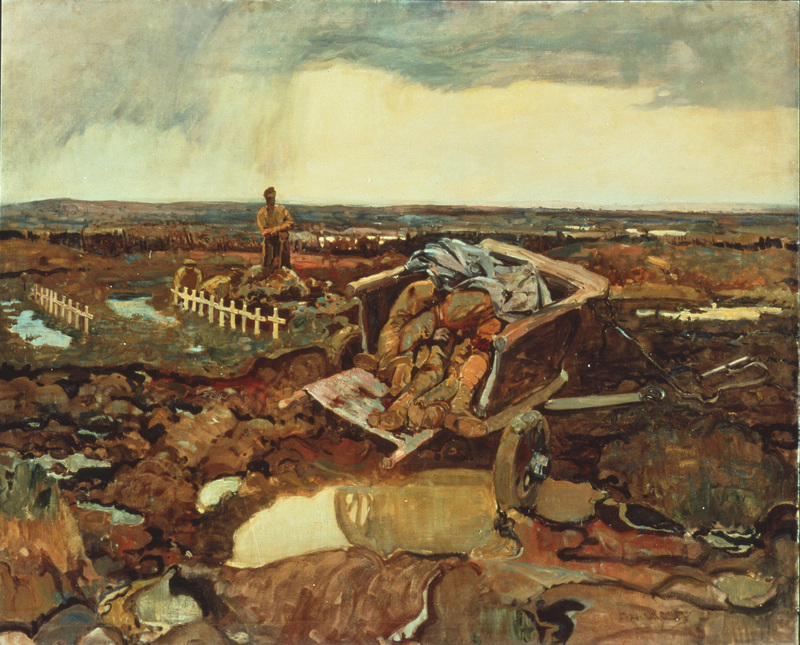 Jackson’s harrowing Gas Attack, Liévin (1918) depicts a blasted landscape: the few trees that remain are reduced to thin, charred trunks, the mud is churned, a water-filled bomb crater stands in the middle ground. On the horizon, blue clouds of gas billow where shells burst red and yellow like fireworks. 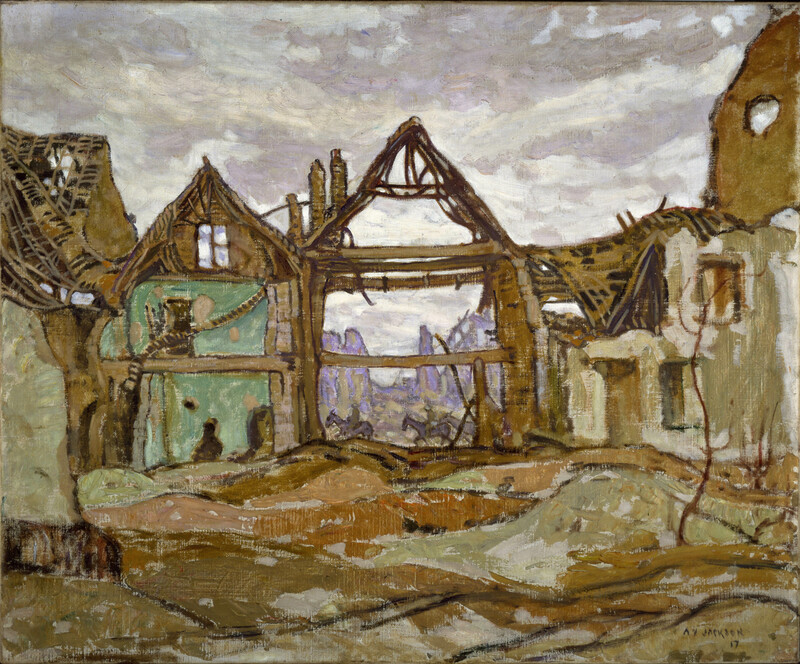 Houses of Ypres, painted one year earlier, shows collapsed and gutted buildings through which one can see soldiers passing on horseback, soft purple ruins behind them. Jackson’s work was always influenced by Vincent Van Gogh — the thick, sensuous way he applies paint, the curving, organic forms, the dense, swarming compositions — but his war paintings are hardly vaulting hallucinations. While attuned to the beauty of destruction, they embody a dark and cruel reality: for Jackson, there are no war heroes, only darkness and ruin and desolation. Jackson, moved by the war’s endless carnage and the rising cost in Canadian lives, enlisted early, was an infantryman in some of the war’s most iconic battles, and was ultimately wounded. Frederick Varley, on the other hand, did not arrive in Europe until 1918 and with a captain’s salary and a monthly allowance for art supplies. He lingered in London for months in considerable luxury, taking in the latest in modern art. Designated as an official war artist — at the behest of Lord Beaverbrook — Varley followed Canadian troops in the Hundred Days’ Offensive through France and Belgium, witnessing plenty of combat along the way. 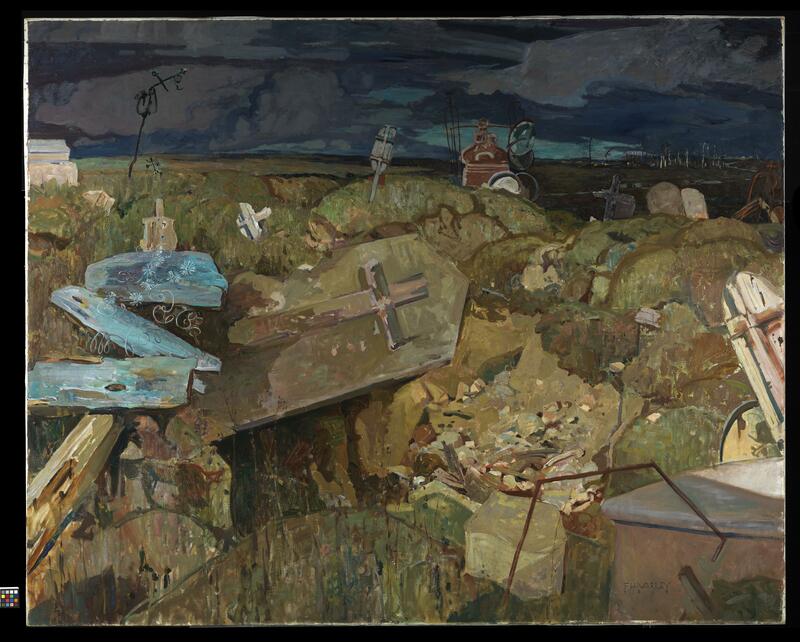 The collective experience of the First World War stripped Canadian art of whatever vestiges of romanticism that might have held over from the 19th century. It is difficult to look at the work created in the traumatized and chaotic wake of the war without seeing it through that conflict’s blood-stained lens. 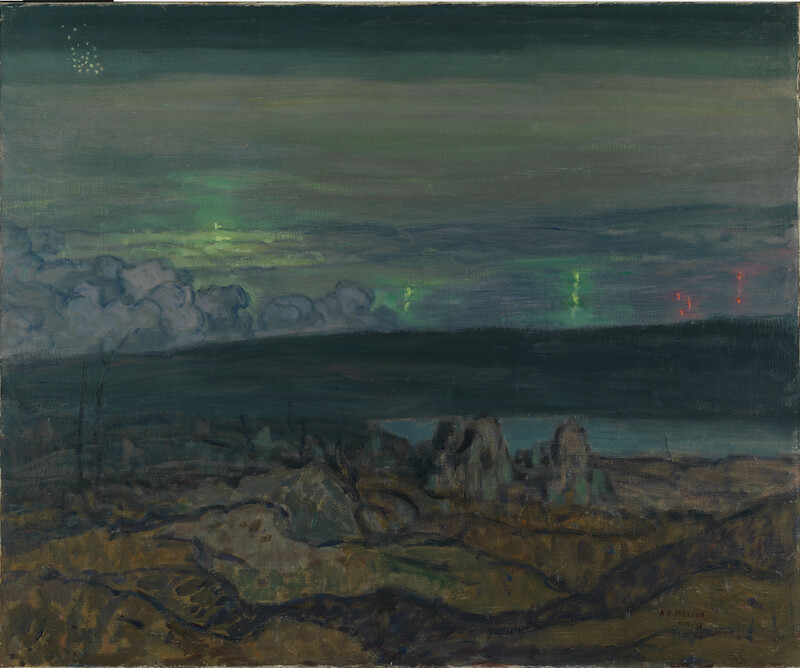 Jackson’s First Snow Algoma (1919–1920), the site of many uplifting pre-war paintings and sketches, has spots of snow swirling down over woods that look like they are ablaze beneath a smoky, menacing, cloud-filled sky. In Varley’s Stormy Weather, Georgian Bay (1921) — another familiar Group of Seven haunt during happier, pre-war days — the wind, churning the lake water to a froth, tears the pine trees to shreds. And in Franz Johnston’s Fire Swept, Algoma (1920), all that is left of a hillside wood are denuded tree trunks. In these paintings, the demons of war, blind and anarchic and inhuman, seem to have been transferred to the processes of the natural world. A Y JacksonA brief article that describes how A.Y. Jackson's post-war art was influenced by his observations of battlefield horror. From the LegionMagazine. F.H. VarleySee a profile of F.H. 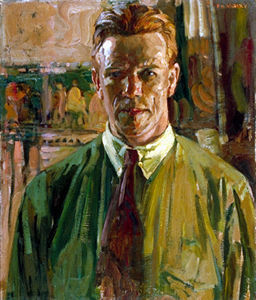 (Frederick Horsman) Varley and selected works of art from the National Gallery of Canada. Canvas of WarAn online exhibit that focuses on Canadian artists who depicted the pain and devastation of military battle during the First and Second World Wars. From the Canadian War Museum.